Kantar-GeoPoll Media Measurement collects daily data on TV ratings, share, and audience size in Tanzania. This unprecedented, real-time information allows media owners and agencies to make more effective decisions on ad buys and programming. This report includes data on the top TV stations in Tanzania from July to September. To subscribe to our full product, which includes overnight ratings that can be filtered by demographics, location, and more, register for a GeoPoll account or contact us for more information. From July 1st to September 30th, 2015 GeoPoll found that the top two stations were in close competition for viewers: ITV had an audience share* of 19.9%, and Clouds was a very close second with a share of 19.6%. EATV came third with a share of 17.2%. TBC1 and Star had shares of 15.2% and 11.3% respectively, meaning that an average of 83.2% of the those watching TV at any one time were tuned in to one of the top 5 stations, with only 16.8% watching a different station. 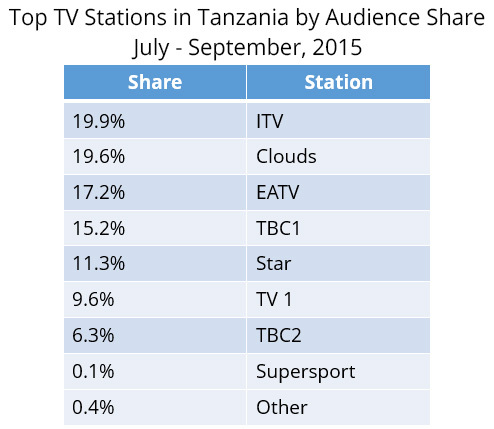 Below are the top stations by share in Tanzania for Q3 2015. The rankings we observed for Q3 have not changed significantly since our last report, which included ratings and share data from April – June 2015. In Q2, Clouds was number 1 with a share of 19.1%, and ITV was number 2 with a share of 18.3%. EATV was in third both quarters, although it lost 1% in share from Q2 to Q3, going from 18.2% to 17.2% audience share. We also examined differences in male and female viewership, finding that Clouds TV has a higher share among female viewers, and that Star TV has a higher share among male viewers. TBC2 is preferred by males, with a male share of 7.5% compared to a female audience share of 5%. Overall, the peak time for viewing TV in Tanzania for Q3 was between 20:00 and 20:30. KGMM is available on a subscription basis in Tanzania with special rates for broadcasters. Click below to contact us for more information and a GeoPoll representative will be in touch shortly. *Share is the proportion watching Station X, out of all those watching at that time. This is equal to the proportion watching a station during a given time divided by the total number watching at that time.